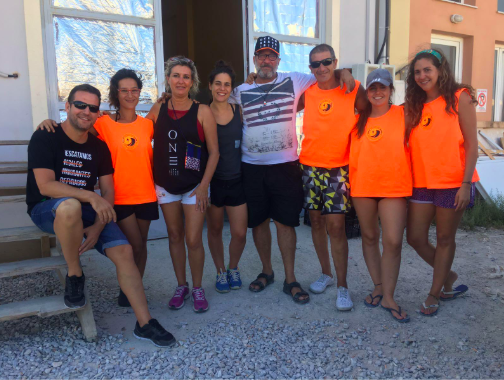 In September 2018 Proemaid kindly invited O Beach Ibiza to visit the island of Lesbos to witness the work of Proemaid and show the importance of awareness and funding for the organisation. During the trip, the charity team invited us to become involved in their importance of their ‘Water Project’ as well as showing us the situation of refugees in their daily routine. 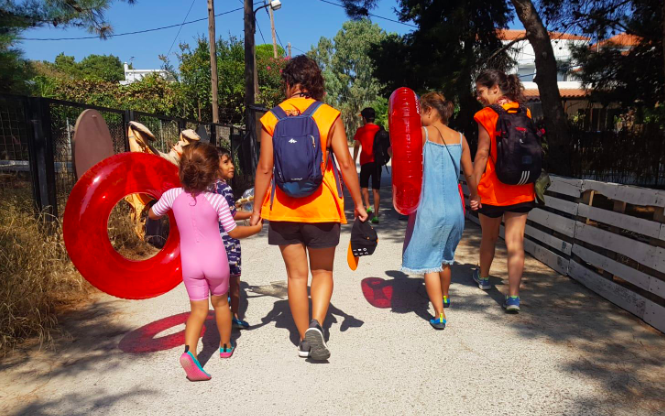 In the last two years alone Lesbos has received a large number of refugees that were fleeing their countries meaning there are more than 8,500 currently residing on the island comprising of 72 different nationalities coexisting in the refugee centres. Amongst these nationalities Syrian, Afghans, and Iraqi civilians make up most of the population. Humanitarian Aid has been a vital support throughout these years for the refugees and Proemaid have focused their efforts in catering for basic needs such as food, clean water, makeshift shelter, and clothes to keep them warm. These provisions are necessary for people to survive and get through their daily lives in the refugee camp. Proemaid comprises of a Spanish group of emergency professionals who have volunteered their skills and time since December of 2015 in the South of Lesbos Island. The Water Project is one of their projects that was born to help refugee children lose their fear of sea after suffering a traumatic experience when crossing it. Throughout the summer Proemaid’s team of volunteers give swimming lessons to the refugee children from different camps every day around the island and thus also enabling them to escape and break routine from the camps. Next on the awareness trip is a visit to the Atikka Warehouse- Proemaid works alongside with this NGO (Non-Profit Organization)- which is the distributor that supplies humanitarian aid in the form of food, clothing and other essential needs in Lesbos. Attika receives its donations from hundreds of individuals as well as entire containers from donors in Holland, Sweden, UK, Germany, Spain, Denmark, and the USA and is crucial for the development of their distributions. Next was to join the swimming lesson in Lasia beach at the south of the island, the children from the Pikpa refugee camp are attending their daily swimming class. Pikpa camp is an independent, open refugee camp that promotes solidarity, empowerment and active participation for those living in this space. The swimming class lessons are developed by Proemaid instructors with the help of volunteers. This team is composed of a nurse, a lifeguard, a translator, a psychologist and a coordinator which makes the perfect skill set to help these children face their post traumatic stress disorder with the water. In this occasion, it is a group of seven children with different levels of swimming experience which ranks between ‘not wanting to be inside the water’ to ‘starting to have a bit of confidence inside of it’. 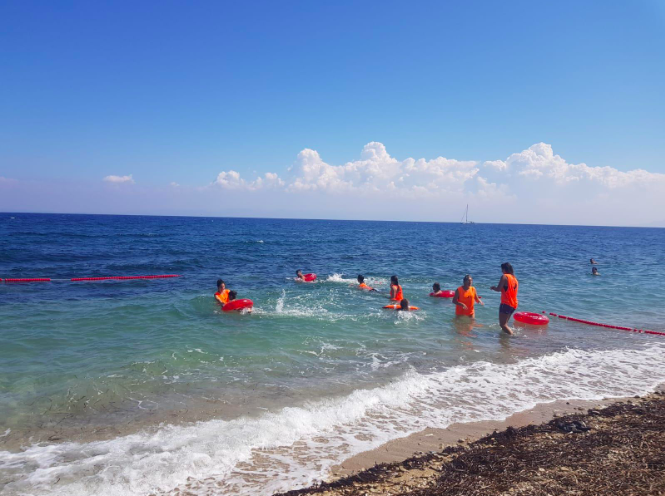 We are lucky to witness the great work by these volunteers and we were grateful to be able supply them some extra tools for their swimming lessons by giving them O Beach Ibiza inflatables which helps provide added fun and colour to the lesson for them and helps the reconnect with their youth. Every one of the volunteers play a key role and the strategy they use with these children is simple but effective; playing up in the sand while approaching step by step towards the water until they feel comfortable enough. Without losing any time, the Proemaid team takes us to Kara-Tepe coast for the second swimming class. In this case, there are not just children but some teenagers that join the class. This group is part of Moria’s Refugee Camp- A camp run by the Greek government that has been in the public eye for a long time due to the poor conditions the Refugees have to live in. With a rigorous list that it’s coordinated by a volunteer of the camp, these young men have to sign up in order to attend the class and improve their ability inside the water. This procedure is necessary because they need to attend for the whole season every day. When the list is out ‘first come first’ and the volunteer has to check everyday they’re all attending. Otherwise that space will be filled with the next person on the ‘waiting list’. After stretching a bit, we get into the sea and help them relax and take a few steps further on their swimming classes. The refugees are clearly appreciative of the lessons and mention to us how pleased and grateful they are, just simply because they feel comfortable floating in the sea. Early afternoon lunch it’s served thanks to the kindness of Julio; a retired Spanish man that made the decision to give up his university teaching skills in favour of becoming a volunteer cooking from his caravan for charity purposes. Julio works alongside Proemaid charity supplying food for both refugees and the volunteers. The menu is always simple but tasty based on Greek products and cooked in different ways in order to honor the different gastronomy cultures that coexist on the island. After lunch, the female volunteers from Proemaid organise another swimming lesson but this time solely with female refugees as for cultural reasons they cannot share the space with their male counterparts. 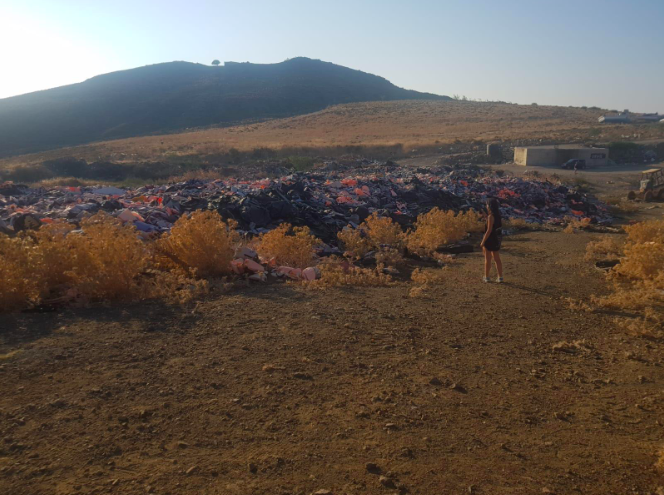 While this lesson takes place the head of the team Manuel takes us to one of the most difficult parts of the visit in which we witness the ‘lifejacket graveyard’. Situated on the north of the island we are taken to a place where adult and child lifejackets, rubber dinghies, discarded clothing, and old boats are taken from the shores as the refugees move on in search of survival. Due to the big amount of boats and people that arriving through the sea to Lesbos coasts, the local council had no other option but to keep them hidden in that area instead of leaving them in the beach. Each of these items has an individual and sometimes harrowing story to tell and as we mentioned earlier they are via the ‘Safe Passage Bags’ initiative they upcycled in to bags and goes towards benefitting the whole community. Our journey ends at ‘Home for a Day’ which is a restaurant owned by a lovely couple called Nikos and Katerina. Opened since 2014 they welcome refugee and volunteers by giving them a place to eat and feel like home at least for one day. A space where both volunteers and refugees can connect and demonstrates another example of the caring humanitarian scheme encouraged by Proemaid. Proemaid cannot continue without your kind support and there are various ways you can donate either by heading directly to www.proemaid.com or if you come to O Beach Ibiza this year you can make a donation alongside your ticket and bed bookings at www.obeachibiza.com or when you enter the beach club you will find a donation box at the front desk.